The latest bar and restaurant to add to Tyneside’s resurgent leisure scene is about to open to the public. The Botanist, owned by the New World Trading Company, has created around 100 new jobs. Set across two floors of the Monument Mall development, which has itself undergone a multi-million pound transformation into a luxury shopping and leisure destination through owners Hammerson, the venue has been designed by Paul Danson of Paul Danson Imagineering, and boasts views across the city. 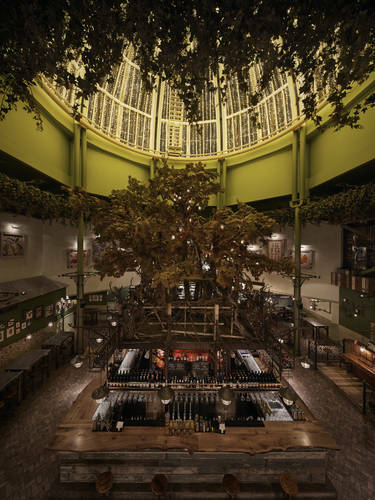 The main bar area is set beneath the domed roof and the bar itself has been built around a huge fake sycamore tree, decorated with delicate tealight-style lamps. Seating for 150 diners is set across a series of connecting rooms looking out across the Monument and Grey Street, and there is a private dining room for up to 10 people. The pub’s opening comes hot on the heels of a string of new Tyneside venues, including Miller and Carter steakhouse, the Stein Beer Keller, Prezzo and Lola Jeans. The new venue is the company’s fifth Botanist to open, marking the bar experts’ expansion into the North East alongside other operations in Leeds, Manchester’s Deansgate, Chester and Alderley Edge. The 8,000sqft bar and restaurant venue in Newcastle will open to the public on December 15. Living Ventures managing director Chris Hill said: “We are delighted to bring The Botanist to Newcastle.